When my friend and neighbor passed away she left her two cats, Lucy (the grey one) and Ethel (the black one). They are 11 years old and up to date on their veterinary checkups. They are pretty freaked out about losing their mom, though they have been more “out and about” in the house lately. 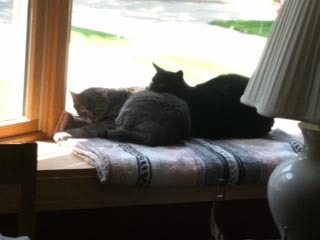 If you believe you have room in your loving home for these two bonded kitties, please contact Sandy, at (815) 315-2768.